TOP PHOTO: Aquavit Bloody Mary with beets, a half-sour pickle spear and fresh dill; photo Flavor & The Menu. MIDDLE PHOTO: Mary garnished with crab claw and dilly beans from Ramos House. BOTTOM PHOTO: Surf and Turf Bloody Mary with bacon and shrimp, plus an antipasto skewer and, as a nod to the past, a celery stalk. From The Wayfarer | NYC. As if everyone who drinks didn’t have enough on New Year’s Eve, January 1st is National Bloody Mary Day. Each year we feature a different Bloody Mary recipe. Some time ago we read about a famed Bloody Mary served at Ramos House in San Juan Capistrano, California. It was made with shochu instead of vodka, lower-proof and lower in calories. 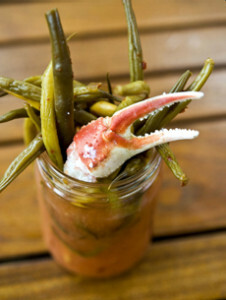 It was garnished with lots of dilly beans (pickled green beans) and a crab claw. 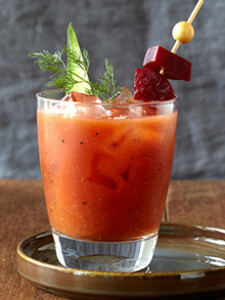 So today’s tip is: Move past the celery stalk to more interesting Bloody Mary garnishes. 1. COMBINE ingredients (except for garnishes) in a pitcher and chill before serving. 2. FILL glasses with ice cubes, as desired. We prefer to pre-chill the drink rather than dilute it with ice cubes. Another option: Make the ice cubes from tomato juice. 3. POUR into tall glasses, 3/4 full. Arrange the garnishes on top. *Mott’s Clamato Juice is packed with HFCS—so sweet you could churn it into sorbet (see our review). It’s easy to mix plain tomato juice with plain clam juice. †We buy Tillen Farms’ Crispy Dilly Beans and Crispy Asparagus by the case, but you can pickle your own vegetables in just an hour or two. Here’s how to pickle vegetables. ‡If you pack the top with garnishes, a straw makes it easy to get to the drink below. How about these red cocktail straws? You can also provide inexpensive bamboo cocktail forks if your guests are too formal to eat the garnish with their fingers. 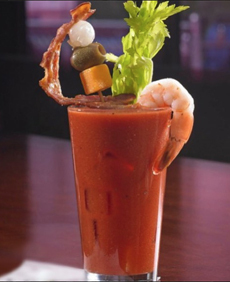 If you have a favorite Bloody Mary creation, please share. HAPPY NEW YEAR FROM THE NIBBLE!